Researchers discovered several critical vulnerabilities in door communication systems made by Switzerland-based industrial tech company ABB. Both patches and workarounds have been made available by the vendor. 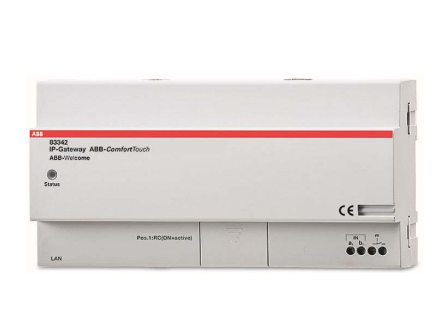 The vulnerable product is the ABB IP Gateway (also sold under the Busch-Jaeger brand), a component of ABB’s door communication solutions, which include audio and video intercoms, fingerprint readers, and access code keypads. The IP Gateway provides the connection between the intercom, the local network and the mobile application that can be used to remotely monitor and control the system. The company’s solutions are used by organizations around the world. According to a security advisory published recently by ABB, researchers Maxim Rupp and Florian Grunow of ERNW discovered several potentially serious vulnerabilities in the IP Gateway running firmware versions 3.39 and prior. Grunow discovered a remote code injection flaw that allows an attacker with access to the local network to take control of the targeted device. The vulnerability affects the local configuration web server and it can be exploited by sending specially crafted messages to the system. Rupp identified a total of three vulnerabilities. One of them, CVE-2017-7931, allows an attacker to bypass authentication and access configuration files and application pages on the web server simply by navigating to their associated URL. According to an advisory published by ICS-CERT, which Rupp has described to SecurityWeek as accurate, the configuration files that can be accessed by exploiting this flaw can contain passwords stored in clear text, an issue tracked as CVE-2017-7933. ABB’s advisory claims plaintext passwords can be obtained by an attacker from the user’s browser cookies following a successful login. Finally, ABB IP Gateway is affected by a cross-site request forgery (CSRF) bug, tracked as CVE-2017-7906, that allows an attacker to conduct various actions on behalf of a legitimate user. These types of attacks can be carried out remotely, but they typically require some user interaction (e.g. clicking on a link, visiting a malicious webpage). ICS-CERT, whose advisory does not mention the issue identified by Grunow, has classified all the vulnerabilities as being critical or high severity. ABB says it has patched the vulnerabilities with the release of firmware version 3.40. The company has also provided workarounds and noted that attacks can be mitigated by using security best practices for protecting a network against external attacks. The most important recommendation is that users ensure the web server cannot be accessed directly from the Internet. The vendor is not aware of any attempts to exploit these vulnerabilities in the wild and noted that details of the security holes have not been made public.